Some of you might have already known Brando was the original pick for Rebel Without A Cause. But did you know he screen-tested for it? And that it survives??? It's included in the new deluxe Streetcar DVD release coming May 2. Most notable: it was done in 1947. Yes, eight years before Rebel finally got made with James Dean. But also the same year as the Broadway Streetcar. 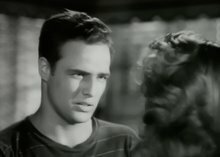 Thus, this will be the first recorded film of Brando the actor at the very time he did that role.